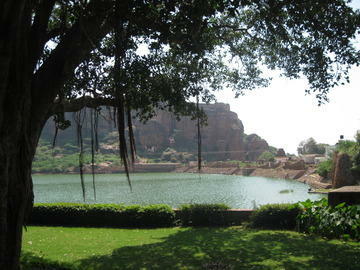 In our opinion, Badami is another must visit for Karnataka. 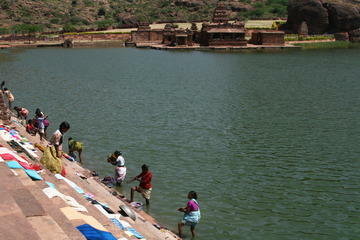 In addition to possessing its own marvels, it is an excellent location from which to visit surrounding sites, as we did. 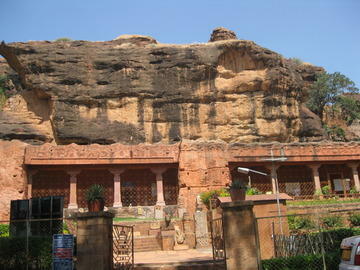 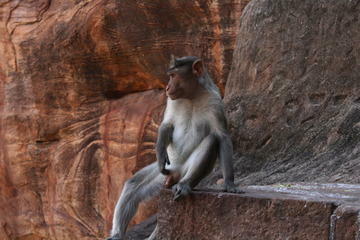 In Badami itself, we loved the rock-cut cave temples. 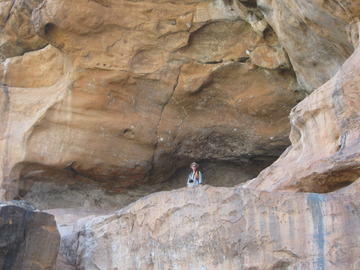 John got much pleasure and some good exercise in walking up to the northern fortress. 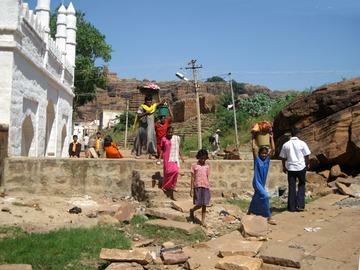 And the local market was absolutely fascinating. 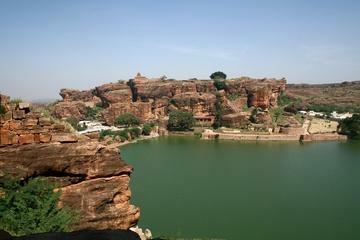 Badami is situated on the western side of a large, spring-fed lake or tank called Agastyatirtha Lake. 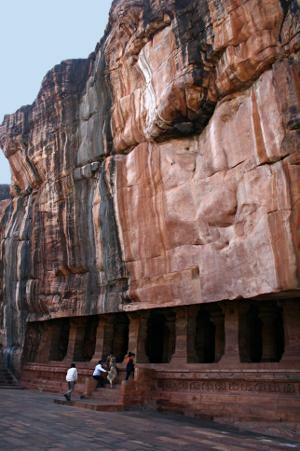 Steep cliffs rise on the northern and southern shores of the lake and the rulers of the Chalukyan empire established forts at the top of both between the 4th and 8th centuries. 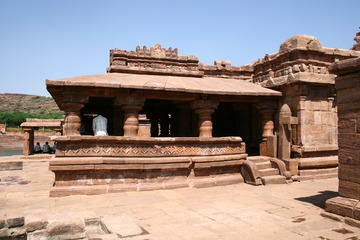 A large number of temples were constructed here, as at nearby Aihole and Pattadakal. 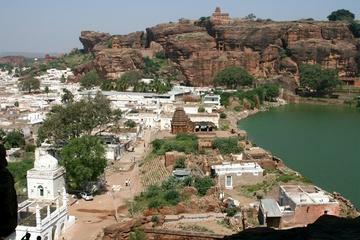 In Badami, there are cave temples carved into the rock of the southern cliff, as well as free-standing temples on the northern heights. 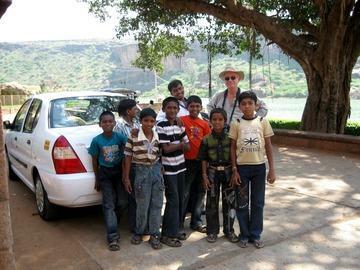 Our first morning, Pradeepa drove us from our hotel a couple of kilometers north of town to the the cave temples in the cliff on the south side of the lake. 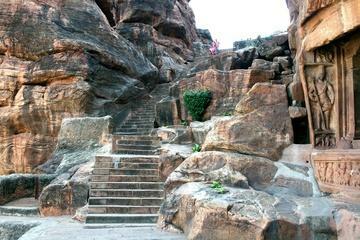 Reaching them requires a slight amount of climbing, but certainly less than 200 meters in all. 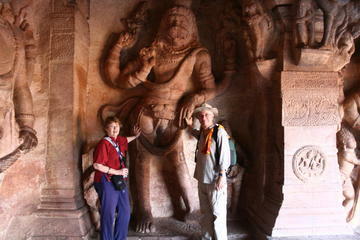 They are quite interesting, both for the caves and the sculptures. 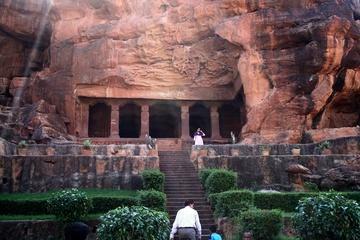 Like the temples at Elephanta Island near Mumbai, these are excavated out of the rock to leave what looks like stone structural elements. 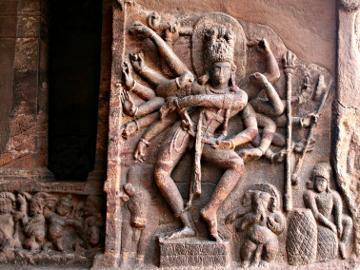 The first, lowest, temple is dedicated to Shiva and has a wonderful 18-armed statue of Nataraja, Shiva doing his dance of destruction and creation. 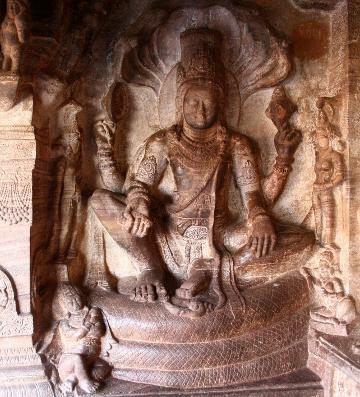 The second temple is dedicated to Vishnu and has some beautiful images of him. 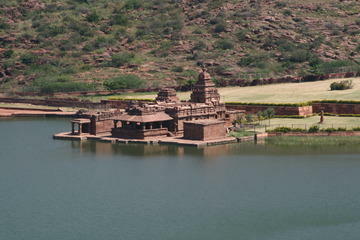 Along the way, there are some lovely views out over the Agastyatirtha and towards the Bhutanatha Temple at the lake's eastern end, as well as over the washing ghats at the western end, towards the town. 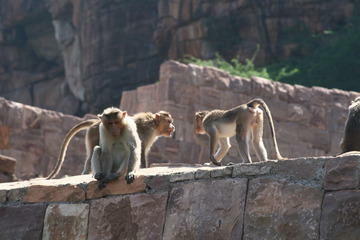 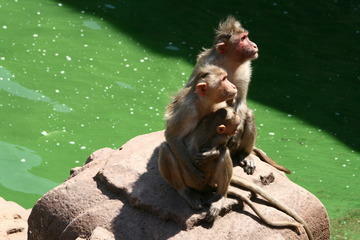 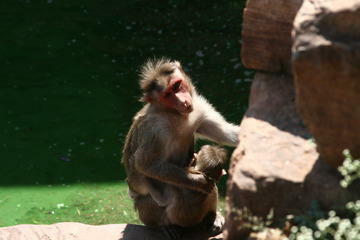 The whole area is overrun with macaques (monkeys). 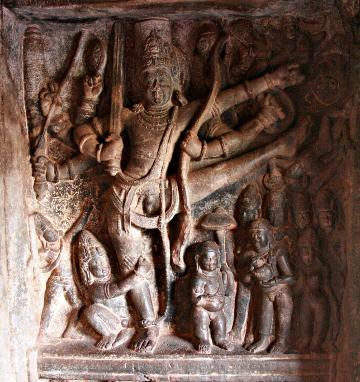 The third temple also is dedicated to Vishnu and has some gorgeous reliefs of Vishnu sitting on the coils of the serpent, Ananta, and another of Vishnu's boar avatar rescuing the earth from a demon. 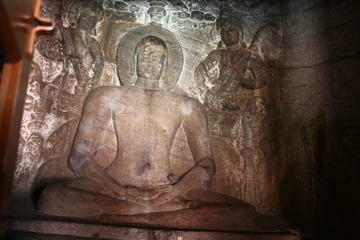 The fourth temple is a Jain temple and has some nice sculptures of Jain tirthankaras, ones who have attained enlightenment. 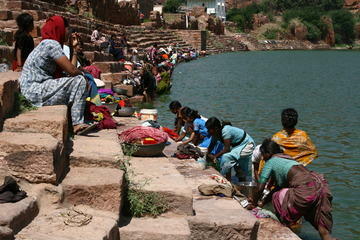 The town is situated on the western side of the approximately rectangular lake and there is a long ghat where the women of the village come to do their laundry. 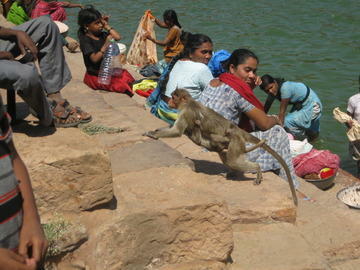 The monkeys mingle among the women, who don't pay any attention to them. 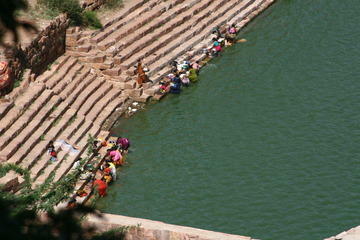 We then went around to the northern shore of the lake. 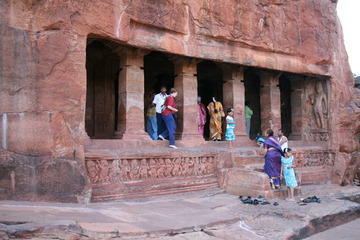 On to Badami 2, the northern fort and the market.